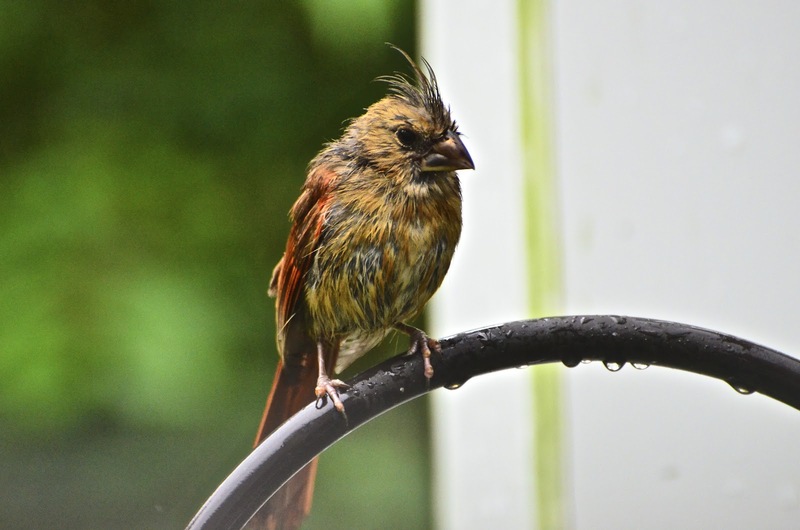 We've had a bit of rain off and on up here in Maine the last several days. 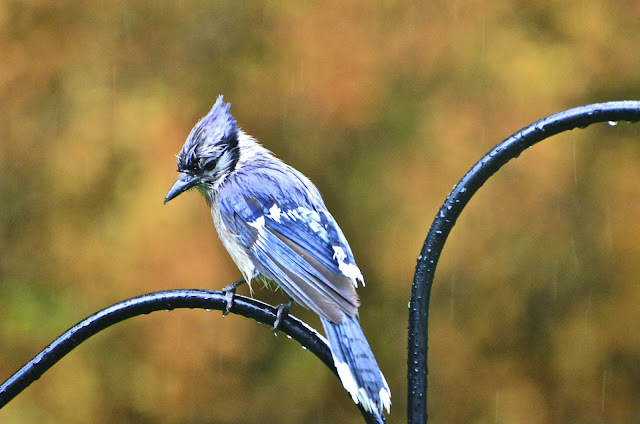 I dug around in my archives and found these photos I took a few weeks ago when we were having some rains in Philly. 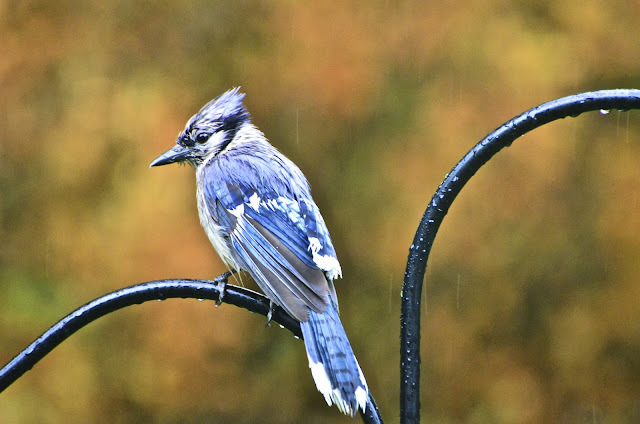 These guys were a bit displeased with the weather. But it didn't hold them back to visit the feeders. I think this little girl was giving me the stink eye! that young cardinal looks dreadful! wish we could have some of your rain - or better yet, ship it to colorado! They do look pretty miffed about the weather and their feathers, don't they!! Love your captures as always, Reena! We surely don't need any more rain here in the northwest and I would gladly ship it to Colorado, too! hope you have a great weekend! The second bird doesn't look very happy! In fact, it looks downright angry... beautiful pics! Fantastic colors! 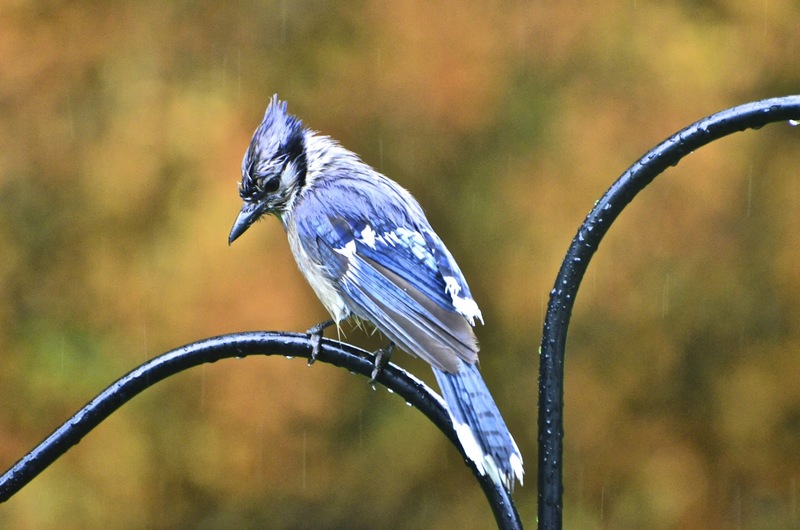 They look bummed, but rain tends to bring out the worms for a smorgasbord. LOL.... that is funny. They do look a little ruffled don't they. They do not seem to have enjoyed the rain, and I think you ae right about getting the stink-eye from the cardinal. They don't look happy:) But what great pictures!!! Happy weekend!!! That last pic - bird really is wearing a scowl. Though disheveled, they are such magnificent creatures! Haha, yep, that looks like stink eye. Can't blame her though. Poor birds. At least they got a good shower. They do look so sad and pathetic:( Gorgeous photos Reena! I don't think they were into being photographed! The poor little things, what they need is a gigantic globe with a lot of food. Though, it wouldn't be a great photos like yours. Yep, That is definitely the Stink eye..
too funny that look on her face! The Birds look like they flew into the washer, then went to the dryer with the clothes. That's hilarious. 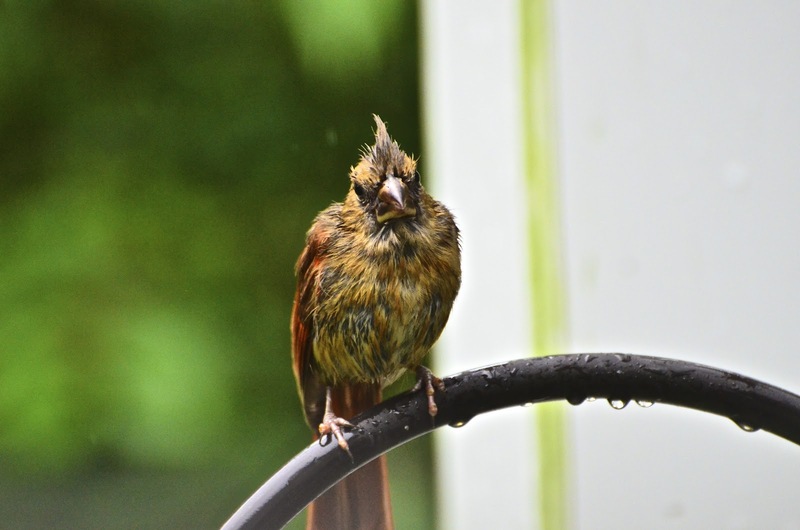 I got some photos of a totally drenched mourning dove the other day. That look from the cardinal is a hoot. That cardinal looks downright cranky! ;-) Oh, how I love the blue ---is it a jay? Beautiful bird images! Great and wonderful expressions on the birds. Great photography also. The day is always beautiful, no matter how. AWWW, they are looking pretty sad and soaked. But, I love the photos, they look cute. I watched a red-headed woodpecker flying through a lawn sprinkler today. He wanted to get wet! Couldn't get any pics though. Angry wet birds are horribly cute! LOL! for the hard cracked ground outside. i'm tucked inside in the shade. bird definitely looks a bit peeved. 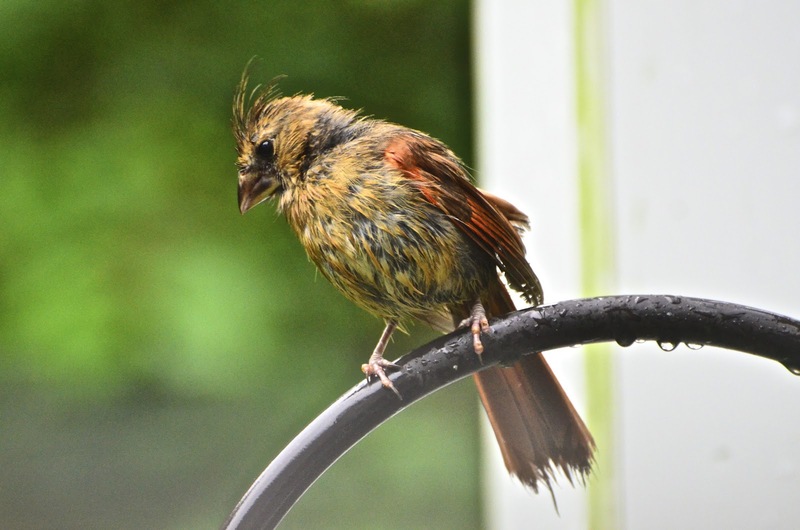 A perfect capture of the word "bedraggled"! Ahhh to be away from the heat and in Maine right now! 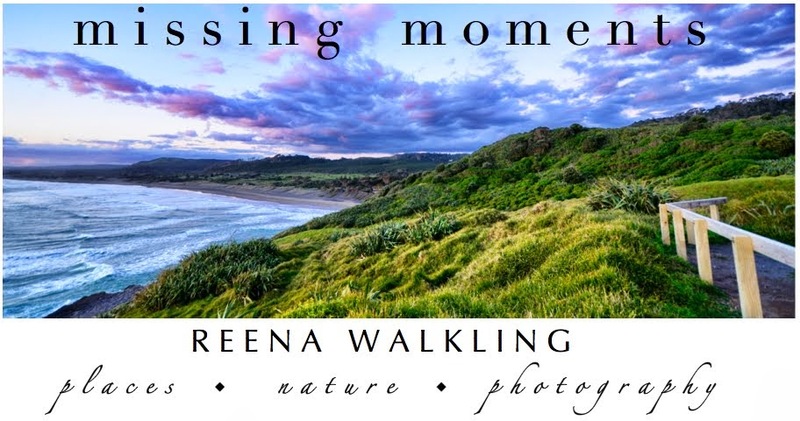 Beautiful images of lovely birds Reena! You have a great eye.